Dental implants are the safe, natural looking alternative to dentures, partials, crowns, and bridgework. 85% of dental implants last at least 25 years and cost only $1,000 per implant. 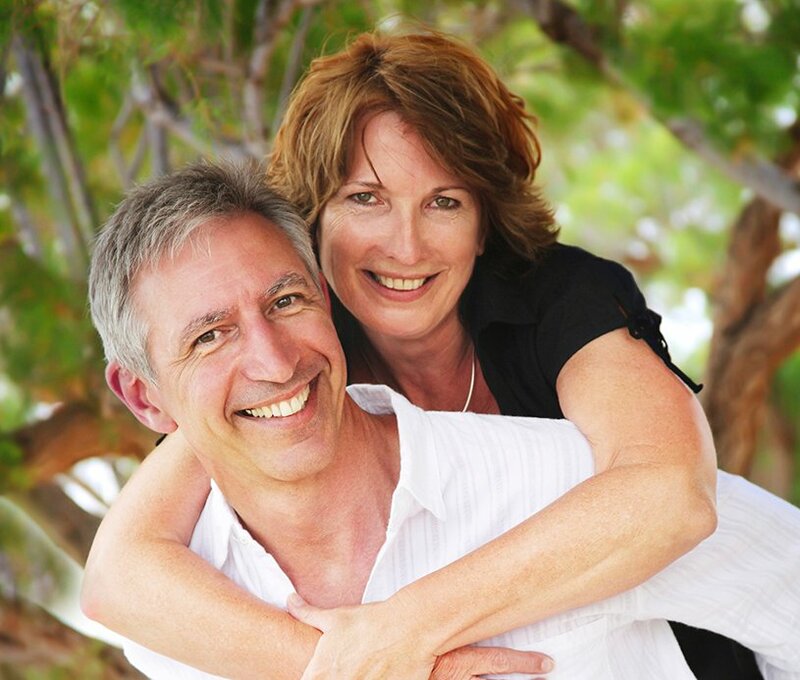 Learn more about Affordable Dental Implants or call Dr. Bonine and Dr. Forgach. Dental implants are the safe, natural looking alternative to dentures, partials, crowns, and bridgework. 85% of dental implants last at least 25 years and cost only $1,000 per implant. Learn more about affordable dental implants. Dr. Bonine and Dr. Forgach utilize 3D Cone Beam Technology which allows for a more precise dental implant treatment plan and that means a better outcome for you. The accuracy of 3D imagery from cone beam technology means a precise surgery plan can be created which eliminates guesswork and lowers the risk of surgery complications. Your implants are more likely to fit perfectly because they can truly be customized fit your mouth. It's normal to feel anxious and concerned. That's why we strongly recommend that you schedule a consult with Dr. Bonine and Dr. Forgach. We will answer all your questions about dental implants and your treatment options. A consult with Dr. Bonine and Dr. Forgach can ease your worries. 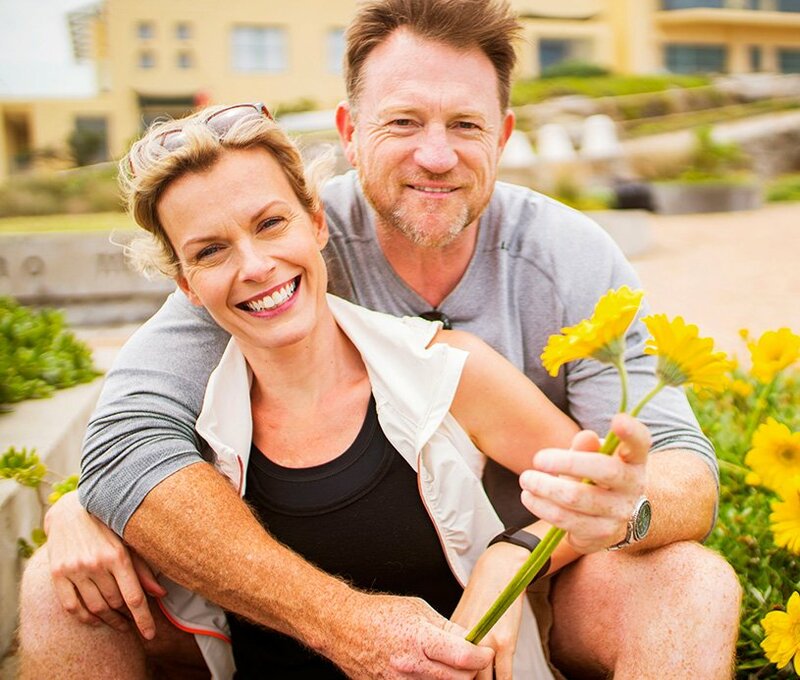 You'll learn about your dental implants and find out about your treatment options as well as the available alternatives. You'll also learn about your options for anesthesia and how they can help you relax and make the procedure comfortable. Dental implants last longer and cost less than a conventional bridge and other traditional procedures. 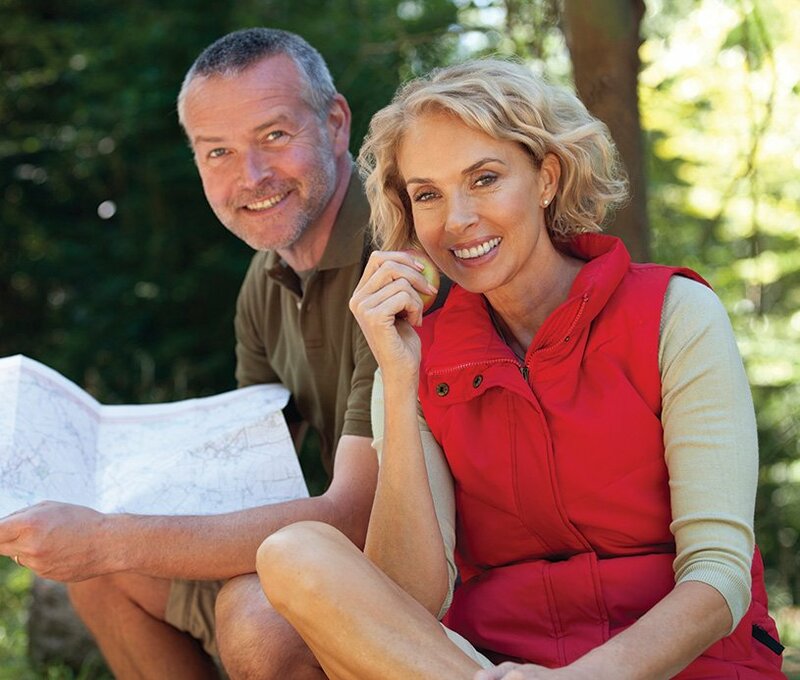 Call Dr. Bonine and Dr. Forgach at 810-229-9180 to learn more about your implant options. The Simple, Long Lasting Tooth Replacement Option. Dental implants are the safe, natural looking alternative to dentures, partials, crowns, and bridgework. 85% of dental implants last at least 25 years and cost only $1,000 per implant. The crown is a separate charge from your dentist. Plan to pay your dentist about $2,170 for the crown. Total cost for the implant and crown procedures: $3,170. Now compare the total cost of the implant and crown to the total cost of a conventional bridge. Over that same timespan, a conventional bridge would have to be replaced three times! As you will see from this cost benefit analysis, adjusted for inflation, it would cost over $24,000. Why do the same procedure three times? Dental implants are the only tooth replacement option that restores your tooth and preserves your bone for long term durability and oral health. Life is too short to do the same procedure three times. Dental implants last longer, cost less than a conventional bridge and other traditional procedures, and preserve your adjacent teeth. Get the Facts About Dental Implants. Call Dr. Bonine and Dr. Forgach Today. 810-229-9180. Cone Beam technology enables precision implace placement for a custom fit and a perfect bite. 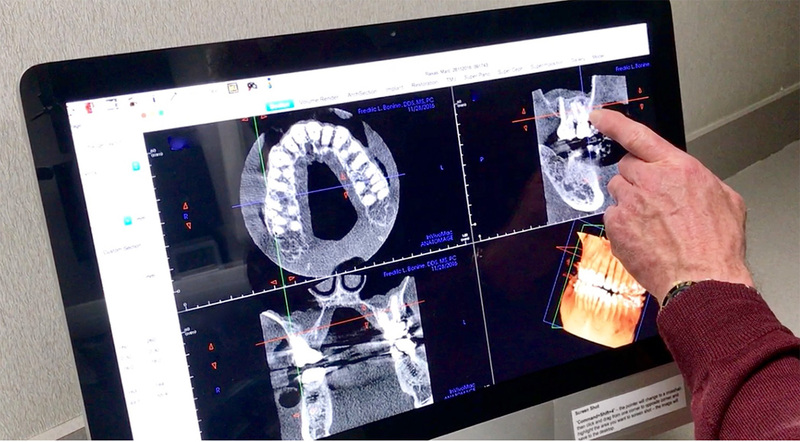 Cone Beam technology provides Dr. Bonine with high definition 3-D images of the jawbone, teeth, and soft tissue structures that are critical to planning the placement of dental implants for a successful outcome. Your implants are more likely to fit perfectly because they can truly be customized fit your mouth. The Cone Beam images help Dr. Bonine and Dr. Forgach determine the optimal location for the titanium implants while avoiding nerves, sinuses, and areas of low bone density. Cone beam imagery allows us to accurately measure and localize the available bone for a better outcome. Because of the cone beam image, he can precisely position the implant in sufficient bone coverage. Ideally, the implant can be placed where the it best supports the restoration by placing it in healthy abundant bone. If the cone beam suggests that the available bone is deficient, we can augmented it with bone graft techniques. We’ve got a simple, elegant solution for people who have lost their upper and lower teeth...it’s called Teeth In A Day. You’ll literally come out of the dental chair with a new set of teeth. You’ll even be able to eat that night. Have you lost your upper and lower teeth? Perhaps you already have dentures but you are suffering through the common problems that come with ill-fitting dentures. We’ve got a simple, elegant solution for people who have lost their upper and lower teeth...it’s called “Teeth In A Day.” Teeth in a Day (also referred to as the All-on-4 Technique, or Same Day Dental Implants) provides an affordable solution compared to dentures and bridges. With teeth-in-day, you’ll literally come out of the dental chair with a new set of teeth. You’ll even be able to eat that night. And go to work the next day. Or go for a bike ride. If you were thinking that dentures were your only option then think again. Not being able to eat what you like or want to eat––like a nice juicy steak. Being afraid or too embarrassed to smile? Losing your dentures from sneezing or coughing? Teeth in a day uses dental implants that act as anchors to attach to a natural looking and permanent set of replacement teeth. So by the end of the day, you’ll be able to be yourself again...to smile naturally, and to order that nice, juicy steak. Teeth in a day has many advantages over dentures. It’s a more natural look. They’re strong and durable, and they will last much longer than dentures, bridges, and partials. Call Dr. Bonine and Dr. Forgach for a consult at 810.229.9180 if you think you might be a candidate for teeth in a day…or if you are unhappy with your dentures. 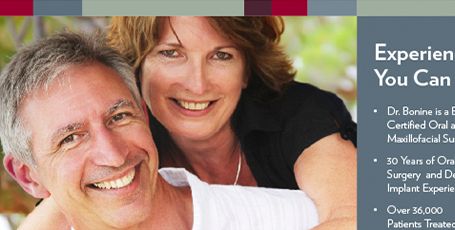 We have great news if you are considering dental implants: Immediate Dental Implants. Instead of having a separate procedure for extraction, and then another procedure for the setting the implant, Dr. Bonine and Dr. Forgach can do it all in one appointment saving you time and money. We have great news if you are considering dental implants. Instead of having a separate procedure for extraction, and then another procedure for the setting the implant, we can do it all in one appointment. Think of all the time you’ll save. Instead of waiting three months for your jawbone and mouth to heal from the extraction, you can combine those two procedures into one appointment. And, you’ll save money. Most of you already know about the benefits of dental implants. Unlike dentures and bridges, dental implants look natural and perform like real teeth. Implants also preserve jawbone density which is much healthier for you. And, in Dr. Bonine’s experience, dental implants last at least 25 years. They are less fussy, easier to take care of, and much more affordable in the long term. Are You a Candidate for Immediate Implants? You’ll need to be healthy, and you’ll need to have enough bone density to qualify for this type of procedure. Call us for a consult. Let’s see if you qualify for an Immediate Dental Implant, or if you would be better served by a traditional dental implant with a slightly longer healing cycle. Call Dr. Bonine and Dr. Forgach at 810.229.9180. Why Should I Have Dental Implants?